A couple of things, today. 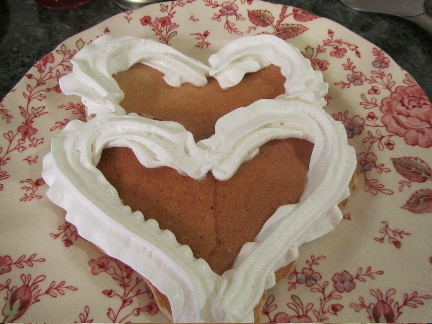 First, some photos of how I make heart-shaped pancakes, with Valentine's just around the corner. 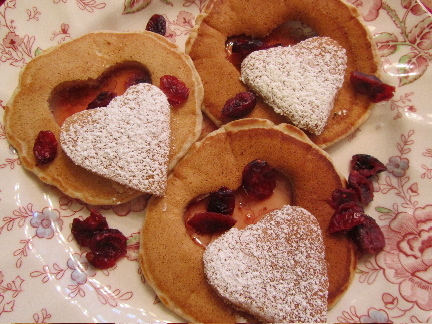 The full post showing two ways to make heart-shaped pancakes, right here. These are easy to make. 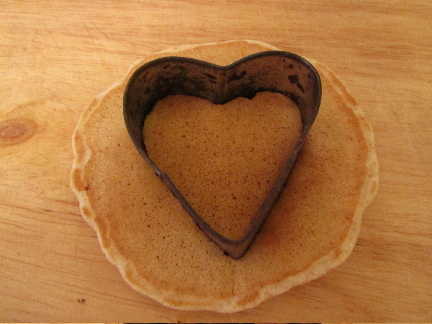 You can pour the hearts out with batter, off of the tip of a large spoon, or cut hearts out of round pancakes with a cookie cutter. It's a fun, and free, thing to do for your loved ones on Valentine's Day, or the weekend before. Or . 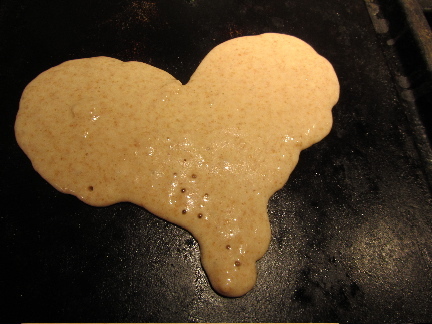 . . . . . .
My "other" thing, heart-shaped pancakes are a definite item for our menu this weekend, at some point, because. . .
my son, Chris, and his girlfriend, Angie, got engaged this past week!!! Congratulations!! You must be so pleased, as you've conveyed countless times how much you like Angie. Thanks for the tip. You're right, because it is free, I'm motivated lol We're watching our grandsons this weekend, so this will be perfect. I adore Angie, and I know the two of them make each other very happy. So, yes, I am very pleased for them both. Oh, this will be a fun thing to do for your grandsons! And of course, it's FREE! Have a wonderful weekend, with them, YHF! Thanks, Cat! I'll convey your congratulations to them. Have a great day! 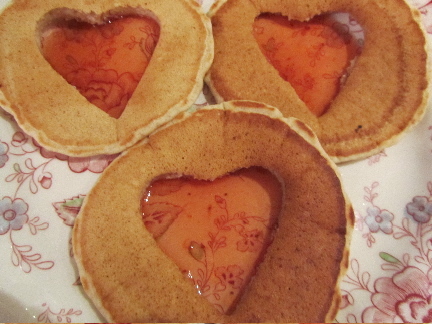 The heart shaped pancakes are so cute for Valentine's Day. I think these will be on our menu for Sunday breakfast. Congratulations on the engagement! How exciting! Do they have a date in mind yet? I've been thinking frugal wedding and reception thoughts lately. I have a suspicion that an engagement announcement is imminent from my son and his girlfriend. Oh, how exciting, Angie! Our sons must be in that same phase of life. It does make us feel a bit old, however! Ha ha! I'm only in my late 30s, so how could I possibly have a son old enough to get married -- ha ha. It does make you wonder how it can feel like we haven't gotten older, but our kids sure have. Thinking good thoughts for your son and his girlfriend, too!! When I spoke to my son the other night, no date yet. They'll both be here on Saturday for an engagement dinner, so I suspect we will discuss details a little bit. We too are awaiting an announcement. So much fun to plan. So many ways to be frugal. Thank you, Teresa! I'll pass on your congratulations. Angie is a sweetheart, and she is frugal, too! Oh, don't forget to share when yours makes an announcement! Is this a son or daughter? It is a lot of fun to plan. I want this day to have special memories for both of them. Have a lovely day, Teresa! The Chinese are very frugal people. So nice when everyone on board is paddling in the same direction!! YHF, you just probably didn't have your children as late as I did! It is, Carol! Thank you! Have a great day! Aww Congratulations! That is great news. 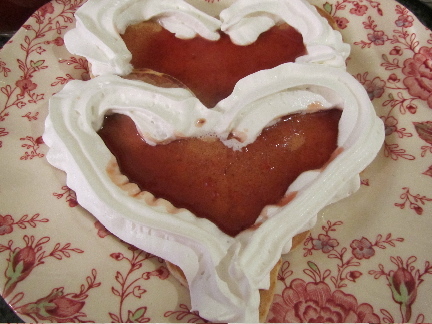 I love the pancake idea. Will make those this weekend. Thank you. I'm pretty happy about the two of them. Enjoy the pancakes! They're a fun, free and easy thing to do for Valentine's Day. Have a great weekend Patti! 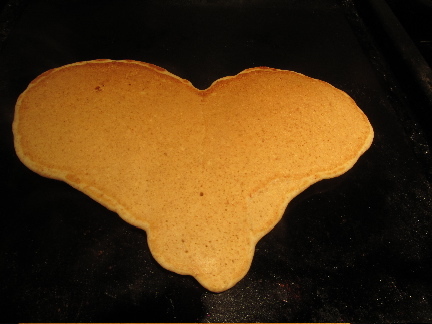 I'll have to make heart shaped pancakes this weekend. It's a nice, but simple idea--just the kind I like. I will pass on your congratulations! These are fun and easy for a special breakfast. I hope you enjoy them! Hope your day is lovely, Mary! Your news about your son and future DIL made me smile. What a day-brightener! I especially love the cookie-cutter idea. Fun! I'm glad my news makes you smile! It is a happy occasion. 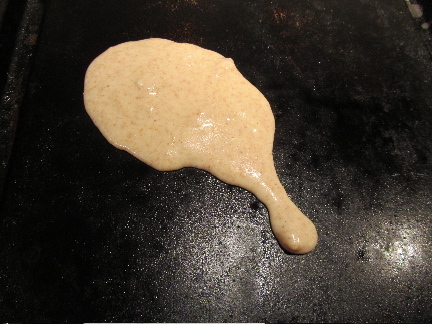 Have fun with the pancakes! Have a wonderful day, Kris! Thank you -- and yes, happy day! Enjoy the pancakes, and have a great day, Melissa! I'll pass on your congratulations! We're thrilled for them both.